Movie: "Kiss Kiss Bang Bang"
While running from the police, a thief named Harry Lockhart (Robert Downey Jr.) stumbles into an audition for an upcoming film. After the audition, he is whisked away to Hollywood and quickly gets tangled in a murder mystery with a childhood friend named Harmony Faith Lane (Michelle Monaghan), who is an aspiring actress, and a private investigator named Perry (Val Kilmer). 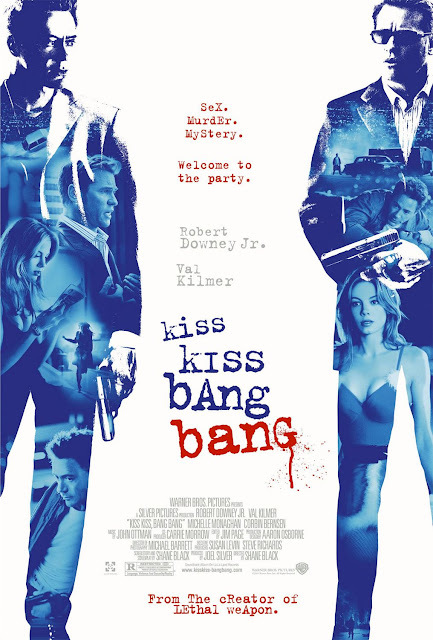 "Kiss Kiss Bang Bang" is the directorial debut of Shane Black, who also wrote the film's screenplay. In fact, he was primarily a writer before this, and has written films like "Lethal Weapon," "Lethal Weapon 2," "The Last Boy Scout," and the cult classic "The Monster Squad." This neo-noir dark comedy stars Robert Downey Jr. as Harry, a thief who poses as an actor during an audition to evade the police for the crime he has just committed. His emotions were so convincing to the casting directors that they thought he was being serious. This lands him at a Hollywood party, where he meets a private investigator known as Gay Perry, played by Val Kilmer, and reunites him with his childhood crush, Harmony Faith Lane, played by Michelle Monaghan. Harry quickly gets tangled in a scandalous murder mystery that may be connected to the perceived suicide of Harmony's estranged sister. This film flew under the radar for us and the masses when it was first released, but has since gone on to develop a bit of a cult following, and we can totally see why. "Kiss Kiss Bang Bang" is full of a ton of witty, tongue-in-cheek humor that will leave you in stitches, and loads of massively sharp dialogue with a lot of word play. The script and its subsequent narration by Harry doesn't shy away from pointing out genre tropes and cliches, which makes it all the more hilarious to watch. Beyond this precision point script, Shane Black is a wiz behind the camera. His shots are artistically beautiful, and he picks them with a purpose. The entire thing has a very cool vibe and style that we can't help but gravitate toward as fans of movies that are considered "different." This film would not be as fantastic as it is without the genius of both Robert Downey Jr. and Val Kilmer, which is something we never thought we'd say. They are both excellent actors on their own, but when they are together here, man, do they make an impact. They are great in this. Each actor offers up their fair share of laughs from their slightly combative reportage. Downey's Harry is a bit of a screw up and doesn't come off as the brightest bulb in the box. He seems to have a confidence that way overshadows his abilities. The entire thing is better with Harry as the narrator of the story. Val Kilmer might not do a lot of high profiling acting like he used to, but his Gay Perry is perfection. Gay Perry is very street smart and doesn't think very much or very highly of Harry. Perry has no problem putting him in his place, which makes the conflict between these two characters all the more enticing to watch. The story is intriguing as well, though it is not as important as these characters themselves. The murder, mystery, and murder-mystery mainly serves as a vehicle for them to discover themselves and for the audience to understand them better. The plot is really all over the place, but we don't mean this in a critiquing way. Its jumbled storytelling allows it to be as successful as it is. Dark comedies are not for everyone, but for those with just the right kind of slightly twisted sense of humor, "Kiss Kiss Bang Bang" is an absolute must see. It has everything: intrigue, suspense, humor, romance, fighting, and of course, originality. One year ago, we were watching: "Clouds of Sils Maria"